After a job interview, take the time to relay your thanks to everyone you met with. 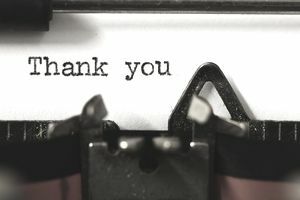 In addition to thanking the hiring manager, spend a few minutes sending a thank you email or note to others you met with at the company. Here's an example of an interview thank you note to send to employees you would be managing if you were hired for the job. Also, see below for a sample of a thank you note to send to a prospective co-worker. Take the time to send individual messages to each person if you met with several members of the team. The basic message can be the same, just vary it enough, so you aren't sending the same message to each person you met with. Depending on timing, you could send it as an email message or a handwritten thank you note. If you expect a decision to be made fast, send an email. Otherwise, a mailed note can make a good impression. This is an example of an interview thank you note. Download the thank you note template (compatible with Google Docs and Word Online) or see below for more examples. It was a pleasure to meet with you yesterday during my interview for Manager of the Marketing Department. I appreciated your well thought out questions, and hope that I was able to address them all thoroughly. I enjoyed the candor and humor that you showed during the interview, and I believe that my management style would work well in your group. I also appreciated you taking the time to share information on the Marketing team and the projects and events you are working on. You were very informative, and I am grateful for the insight you provided. Thank you very much for taking the time and consideration to meet with me. If you have any additional questions, please don't hesitate to contact me directly. I wanted to take this opportunity to thank you personally for all the time you spent with me when I visited your office. I have thought quite a bit about the possibility of joining your team and believe that, in addition to the contributions I could offer, I would learn a lot from you and benefit greatly from your talent, wisdom, and experience. I am very interested in working for ABCD company and look forward to hearing about this position soon. If there is any other information I can provide to help expedite the decision making, please let me know. Again, I appreciate the time you took to talk with me.